We are proud to announce that AVAST has been named best large-size company employer in the Czech Republic by global HR consulting and outsourcing firm, AON Hewitt. 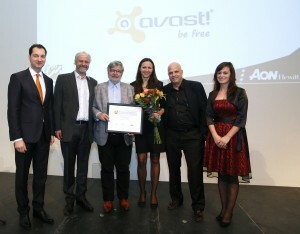 AVAST HR Director Kamila Štěpánková and CEO Vincent Steckler accept the Best Employer award along with AVAST co-founders Eduard Kučera and Pavel Baudiš. The annual study’s results were evaluated based on the HR policies of the companies, as well as feedback from their employees and leaders. AVAST excelled in all attributes of the study, scoring above 80% in each category. The categories of the study are: engagement rate, trustworthy leadership, high performance culture, attractive employer brand and sustainability. With these high marks AVAST beat MICROSOFT s.r.o and SAP ČR, spol. s.r.o. for first place. AVAST scored an impressive 89% in engagement, 49% more than the Czech average. According to AON Hewitt, company engagement is a key influencing factor in the final ranking, and reflects the employee’s intense desire to be a member of the company, their consistency in speaking positively of the company overall and the extra effort and engagement in their work that contributes to the success of the business. I am extremely proud that AVAST has been named best employer. The entire company constantly works together to maintain the extraordinary company culture the founders established 25 years ago, which gives employees freedom in completing their tasks and flexible working hours. The employees have the opportunity to contribute to the most trusted antivirus software program in the world, a product that protects 200 million users, that is both a huge honor and responsibility that makes their daily work interesting and compelling. If you would like to become apart of AVAST’s team, please visit the AVAST’s careers page to see if there is an available position for which you are qualified for.